I am part of the Minnesota Knitters’ Guild and one of the main things the Guild does is service knitting for various charities. One of our projects this year is to knit Christmas stockings for all the kids who live at Jeremiah House. I realized how soon Christmas was going to be here and realized I needed to take a break in my other knitting to get a few of these done! So far, I have finished these two. The pattern I am using is the Lily Sugar n’ Cream Knit Stocking a free pattern from Yarnspirations. My yarn is Red Heart Super Saver. First of all, I changed how they did the heel. The pattern calls for picking up stitches and and doing turns, just like a regular sock heel. Well, I was kind of dreading that and then remembered that one of my friends was making socks with afterthought heels, so much easier! When you come to the point where you want the heel, you knit half the stocking stitches on to scrap yarn. You move those stitches back to the left needle and knit them again with your working yarn. Then just finish the stocking like normal. When you are finished, you put the stitches above and below the scrap yarn on needles, remove the scrap yarn and basically knit another toe. It is brilliant! 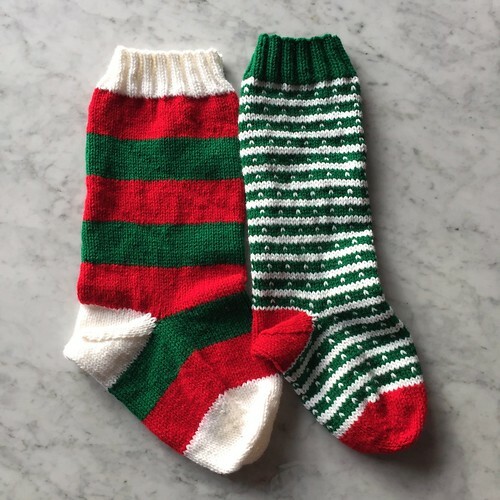 Secondly, I did the red and green striped stocking exactly as the patterns written (except for the heel), but I felt it was a little too wide. So, for the green and white stocking I only cast on 56 stitches. I felt like it gave a much nicer shape. Finally, I changed up the color pattern on the second one. This green and white pattern just has two stripes of white, a stripe of green, a green stripe where every forth stitch is white, and another green stripe. Very easy color work. I did jogless stripes, so there was no jump between the rows. I also didn’t have many tails to weave in since I just carried the colors the few rows. This was a great basic pattern to play with and I can see doing more complicated patterns on it when I have more time. In the meantime, I think I can get three more stocking out of my yarn. I know what I’ll be doing during my 20 hours of car time over Thanksgiving! 2 years ago by Kat in Christmas , Holiday , Knitting , Knitting Projects , Needlecraft , Projects | You can follow any responses to this entry through the RSS feed. You can leave a response, or trackback from your own site. The second one is a nicer shape but you can fit more presents in the first one! I know, it sounds confusing, but it is easier than it sounds. It is just like when you do an afterthought or peasant thumb on a mitten. I did a photo tutorial on how you do the thumb here, http://www.justcraftyenough.com/2016/01/winter-snows-mittens-mkal-clue-2/ . If you google “How to do an afterthought heel” you will find all sorts of video and tutorials.